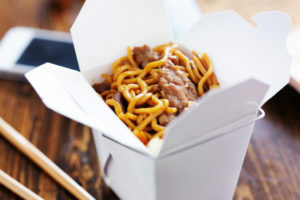 Here are healthy Asian menu ingredient swaps and preparation tips along with flavor-packed recipes from Cleveland Clinic nutrition experts. Love Chinese, Thai, Japanese, Korean or Vietnamese food? 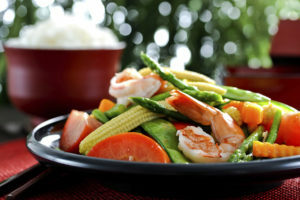 Asian cuisine offers a rainbow of vegetables and lean proteins. But hidden salt, fat and other stealthy additives can quickly sabotage this heart-healthy fare. Be good to your heart by following these tips from Kate Patton, MEd, RD, LD. Opt for steamed dumplings instead of ordering egg rolls and fried dumplings. Sidestep fried or breaded meat entrees. Instead, choose baked, broiled, grilled, sautéed protein sources-chicken, fish, shellfish, lean beef or pork. Fill your plate with a variety of veggies, whether boiled, broiled, steamed or lightly-stir-fried (e.g., chop suey with steamed rice). Choose steamed vs. fried rice to avoid large amounts of sodium, MSG, calories and fats in the fried version. Better yet, ask for a bowl of steamed brown rice. Ask the cook to use less oil and soy sauce, and to skip the MSG and salt. Opt for mung bean or rice noodles over white refined noodles. Start off with fresh ingredients. Foods that are local and in season offer optimal nutritional benefits. (Add bok choy, napa cabbage, bean sprouts and watercress to your shopping list.) Then follow these tips for healthy Asian cooking. Stir-fry is your friend. When you need to whip up a quick but nutritious meal after a busy day at work, gather all of your favorite veggies and some lean meat. Add a touch of oil to your wok or a large pan. The trick to stir frying is to use high heat for a short amount of time to avoid overcooking your meal, which destroys key nutrients and ruins texture. Sautee your protein first, then your veggies. Throw in your favorite spices for an extra flavor kick. 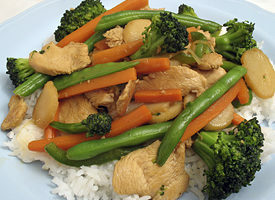 In no time, you will have a low-fat, low-sodium dish chock full of fiber, protein, vitamins and minerals on the table. If the meal starts to become dry, instead of adding oil to the pan, add some reduced-fat broth to keep it going. You’ll avoid the fat from extra oil. Stock your pantry with Asian flavors. These flavor-enhancing ingredients will eliminate the need for MSG, extra sodium and extra sugar to boost flavor. Fish sauce: Deepens the flavor of other ingredients better than salt. And while it does contain salt, fish sauce also has protein, heart-healthy omega-3 fatty acids and other vitamins/minerals. Be sure the label lists only fish, salt, and maybe water as ingredients. Soy sauce: This Asian cuisine staple is made from fermented soy bean paste. Choose a low-sodium variety because soy sauce is high in sodium (and we Americans get enough salt), and control portions. Chili sauce: Made from red chilies and garlic, and a source of vitamins A and E. Not only will it add a kick of heat to any dish, research shows ground chilies can lower inflammation and boost immunity. Rice vinegar: A very low-calorie ingredient to use in marinades and sauces. Curry paste: A combination of spices that together offer an intense flavor. Includes turmeric, which studies show has anti-inflammatory as well as antioxidant properties. Lemongrass: Commonly used in Thai cuisine, it’s a great source of iron and potassium. Fresh coriander (cilantro): Packed with dietary fiber and a good source of vitamins and minerals. Dried ingredients: Asian cuisine, especially Chinese cuisine, uses dried mushrooms, shrimp and clams to pack a flavor punch. Control portions with dim sum. The bite-sized portions and elegant appearance of steamed buns/dumplings and pot stickers make for a delicious, healthy meal choice. Buy wonton skins from the store or make simple dumpling dough from scratch. Steam, rather than fry, dim sum. Pull out the soup pot. Soups — think beyond egg drop and wonton — play a major role in Asian cuisine. Sautee your favorite veggies, followed by Asian spices. Add organic vegetable bouillon or stock, and cooked lean protein. Simmer until done for an effortless, healthy, no-recipe meal. Whip up sauces from scratch. Control the type and amount of each ingredient going into your meal by making your own sauces. You’ll avoid high levels of sugar, sodium, fat, monosodium glutamate (MSG) and other chemicals typically found in store-bought Asian sauces. Use your pantry staples above to create Asian sauces. Try your hand at making black bean sauce using fermented black beans, low-sodium soy and stock. Go meatless with soy. You don’t need to be a vegetarian to enjoy the benefits of tofu and edamame, both rich in protein and calcium. Tofu takes on the flavors of other foods, and easily absorbs the flavors of spices and marinades. Edamame has all the hallmarks of a heart-healthy food: plant-based protein, soluble fiber and omega-3 fatty acids. Round out the meal well. Serve your meals on a bed of steamed brown rice or buckwheat noodles. Satisfy your sweet cravings with fresh fruit. As with other cuisines, when you prepare Asian food, make sure you’re getting a good balance of nutrients. Be aware of exactly what and how much you’re eating, and enjoy a heart-healthy feast.